Smiles 4 Miles Dental Cosmetic Dentistry. What causes teeth to change in appearance? 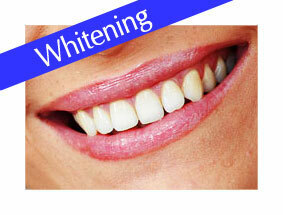 What we can offer you to enhance the appearance of your teeth? Firstly, there is the "Take Home Kit" option, which is done by getting a set of custom made trays made and taking home tubes of bleaching agent. At home, the patient then needs to apply the bleaching agent into the tray and wear the trays for a specified amount of time. The process generally calls for a one to two hour application of the tray for 7-14 days. The patient needs to be responsible for wearing the trays consistently throughout the treatment period to achieve required results. Veneers are a conservative and effective way to improve the appearance of your smile. Veneers have many uses and can hide discolourations, brighten teeth, change the shape or position of teeth or fill in gaps. Veneers are more resistant to stains than bonding materials. 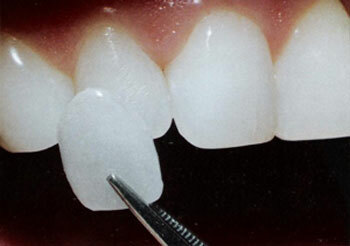 Veneers are very thin and give a natural translucent. Veneers are a thin shell of porcelain which are bonded onto your teeth, similar to false fingernails, but much harder and more durable. Veneers involve removing a small amount of tooth structure and Patients who need only minor tooth alignment problems are corrected with veneers. Crowns are often called "caps". When teeth have been badly damaged by decay with large parts missing, broken or worn excessively, crowns should be routinely made. A Dental crown helps strengthen the tooth by being a hard outer shell that protects the tooth structure within. The crown in effect becomes the tooth's new outer surface. 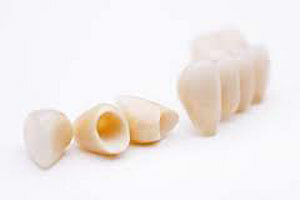 Crowns are routinely made for extensively broken and worn teeth. The crown can restore a fractured tooth, protect weak tooth particles from breaking, restore an implant, hide a discoloured or poorly shaped tooth and help seal a root canal treated tooth. Importantly and most commonly a crown replaces a large filling when there isn't enough tooth left, protecting the tooth before it breaks. Crowns are commonly made of all porcelain, metal with porcelain or gold. Today with new technology available we can make crowns to look exactly like your teeth especially if the crown is all porcelain. However, an all porcelain crown is not always possible. 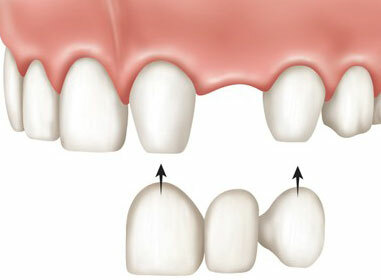 Bridges are a method of replacing one or more missing teeth. They fill the gap where the teeth are missing by spanning and anchoring to the teeth either side. Bridges, like crowns are cemented to natural teeth and are fixed. Their purpose is not only cosmetic, filling in gaps made by missing teeth but also improve function and prevent major problems which can be associated with spaces allowing teeth to rotate and shift. Leading to problems with correct, comfortable bites. Bridges are made of a choice of materials depending on which is most suitable. Bridges are normally made of porcelain with a metal substructure. The porcelain gives the cosmetics and the metal the strength and good fit. Porcelain metal bridges are similar to porcelain metal crowns, due to the metal substructure the translucency is not the same as natural teeth. Smiles 4 Miles offer Composit mercury free dentistry. Photos: 1) Before; existing amalgam filling. 2) Decay removed and tooth cleaned, 3) Showing decay under Amalgam filling, 4) Restored tooth with composite 5) Rubber dam in place.